Okay! On Tuesday I posted all about the perks of having a writing buddy (and yes, I named it that because it sounded like The Perks of Being a Wallflower). Anyway, since in that post I introduced you guys to my cousin/writing buddy, Cassidy, I thought it would be fun for her to guest post on the blog. Enjoy! Today I want to talk about a quickly emerging trend in YA literature: female main characters. And not just any type of female main character, oh no! Strong female main characters. Gone is the damsel in distress of the past! No longer will the desire for a man to sweep her off her feet be tolerated! Never again will a lady character enjoy wearing dresses or lack the ability to beat up a man twice her size! Vulnerability is unheard of! Crying is not allowed! Your main character must be a strong, independent woman who don’t need no man, and shame on you if you write her otherwise! Wait, wait, wait, back up a little. What? Weren’t they supposed to be female? If your character hates wearing dresses, that’s fine. If she’s been trained in martial arts and can take down a ginormous man, lovely. If she is completely emotionally stable and doesn’t need to confide anything to anyone, okay. But these things are not what make a woman strong. Too often, when writing ladies to be strong, we end up taking strength and replacing it in our heads with masculinity. Your character doesn’t have to despise all feminine clichés to be strong. She can love fashion! She can want to fall in love! She can cry when she wants to cry, gosh darn it! She is a woman, not a robot. There are several types of strong female characters that show up today in literature, but I’m going to zero in on the top three and why each of them can be appealing to an audience, what makes them strong, and why each of them can be a turn-off to your readers if done poorly. See Piper McLean (The Lost Hero,) Sabrina Grimm (The Fairy-Tale Detectives,) Katie Weldon (Peculiar Treasures,) etc. This is a big one. Like I said before, many writers are scared to give their girls space to be girls. We see a lot of girls who abhor skirts and dresses, can knock someone out with one punch, wear their hair up ALWAYS, can eat their weight in pizza, and generally despise all others of their gender as well as their petty dramas. I love tomboy characters! I was a tomboy when I was younger. I loved Ninja Turtles and playing sports. I was very proud of the fact that I hardly, if ever, wore dresses. And you know why this was? I was primarily friends with boys. I was homeschooled all the way from kindergarten to high school graduation, and between the ages of five and thirteen, I had two different sets of boys living next door. They, along with my little brothers, were my best friends. They were the ones I saw every day. I was surrounded by boy influences. Girlfriends never really appealed to me. Sure, I had one or two at church, but in general, they weren’t my type of people. They liked to talk about crushes and drama and American Girls. I wanted to run around outside with the guys, whose social rules were far less complicated. Basically, it’s okay for your character to be a tomboy, as long as she has a reason to be. Tomboys can be very appealing, because they can make girls feel empowered, and their viewpoint is far more likely to be tolerated by male readers than the heel-loving, prom-going girl viewpoint. But they can also make girls feel like they should be ashamed of liking girl things, and that’s where you have to be careful. You want to make girls proud to be girls, not embarrassed of their love of twirling skirts and chick flicks. What makes tomboys strong is that they’re not afraid to be themselves, even if it isn’t the norm. See Juliette Ferrars (Shatter Me,) Wanda (The Host,) Rue (The Hunger Games,) and Primrose Everdeen (The Hunger Games.) This one is tricky. Oftentimes when writing profoundly innocent characters, we take their innocence and translate it as naiveté, as something that needs to be fixed. We turn our characters into blissfully ignorant saps who cry at every dose of reality shoved at them, but our other characters continue to shove these things in their faces, because eventually it will bring them into the real world. But that is not what innocence is. Innocent characters aren’t usually unaware of the world they live in. They aren’t usually uneducated in vulgar and violent things. They often haven’t gone through life untouched by hardship or loss. Innocence in a character simply means they have not allowed the evil in their world to scar them. Your character’s innocence will manifest itself in different ways. Maybe she doesn’t use vulgar language. Maybe she doesn’t make inappropriate jokes. Maybe she makes an argument in favor of the villain, because everyone deserves a second chance. Maybe she refuses to kill, period. Innocent characters can be appealing to an audience because their goodness is refreshing. Especially in dark books where many characters are struggling with moral dilemmas, the innocent character can be a shining beacon through the shadows. They stubbornly stick to what they know to be right and they don’t let anyone persuade them otherwise. However, like I said before, this can easily be turned into a bad thing. If we take innocence and turn it into ignorance or outright stupidity, we take that shining beacon of goodness and turn it into a blinding flash of irritation. No one wants a character who is completely unaware of (or unwilling to become involved with) the conflict going on around them. What makes the Innocent Flower strong is their unwavering devotion to doing the right thing, no matter how hard it is. Similar to the Tomboy, the Rebel is emerging as the #1 most popular strong female character type. See Katniss Everdeen (The Hunger Games,) Tris Prior (Divergent,) America Singer (The Selection,) Melanie Stryder (The Host,) Tessa Gray (Clockwork Angel,) etc. Basically, whatever they are expected to do…yeah, they’re not gonna do that. The pros about this type are numerous. Rebels inspire us. They make us take pride in our innate human freedom, make us want to fight for what we deserve. They make us want to be ourselves and not care what anyone else thinks. In fact, if someone disapproves, we go after what we want all the more. The danger here is creating a character that simply rebels for the sake of rebelling. A causeless rebel is just a person who likes saying no. If your rebel starts rebelling against everyone—for no real reason—she will soon end up on her own, with no allies to speak of, and you know what your readers will say? “Serves her right.” They won’t sympathize! Your rebel brought this on herself! She refused to play nice with anyone, and now she’s lost her cause, her friends, and her safe haven. Your rebel has to pick a side to rebel against, then work with the opposition to that side to make her rebellion worth something. What makes rebels strong is not their rebellion itself, but the firm convictions behind it. They believe in something and they’re willing to fight for it. There are many other types of strong female characters you can write, but these are the three I see most often. What about you? 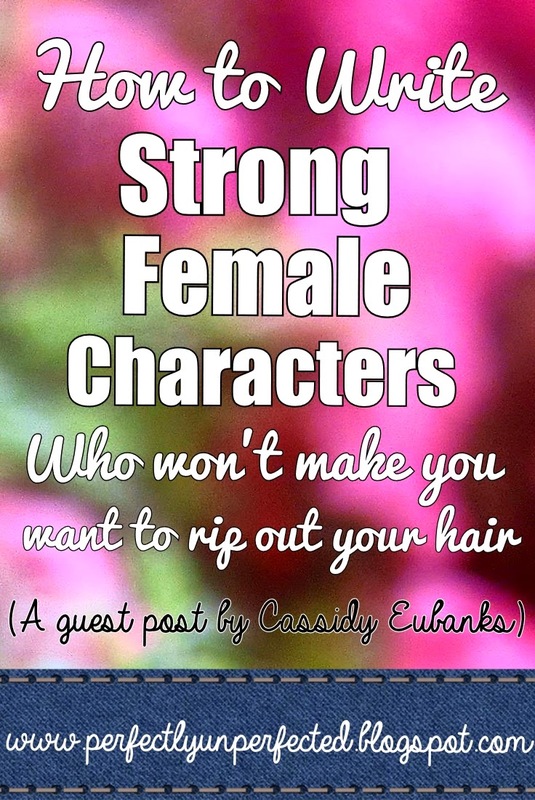 What do you think makes a female character strong? So there you have it! Three fantastic archetypes for female characters and how to write them so they aren't horrible and flat. If you liked this post, make sure to check out the rest of the blog and subscribe! And for more information about the lovely and talented Cassidy Eubanks, you can find her on Pinterest, Twitter, and Wattpad. I was reading a book a little while ago, and the protagonist was one of those so-called "strong" female characters. She made me want to pull my hair out because no matter who she came into contact with, she was going to attack them. That protagonist was The Rebel you wrote about in the last section of your article, but she didn't stand for anything. And, just as you foretold, by the end of the book I was saying in my head, "Ha! See, that's what you get, you meanie you." Thanks for offering some tips on how to create female characters who can cry if they want to, gosh darn it! This was a fantastic overview of strong female characters. It's nice to have a rant, but I enjoyed reading about your solutions to the problem. There are so many books out there that don't really dig deep into character, it's all about plot and action. I think everyone who wants to improve their characterization should read this post. Thank you so much! This is really helpful! I usually don't read this stuff, but it got my attention right away. As a young author (of only 13) Developing characters is something I never got the hang of, but I think you might really help me. I'll be sure to check out the rest of the blog - I think you're doing a brilliant job! YASSSS! Love this post so much! I find it very difficult to slog through a book with a so-called strong "female" character, because she is rarely a strong woman but a strong PSEUDO-MALE. The true sexism is in ripping all the femininity out of a female character. Why is it supposedly so shameful to be feminine?! A Snippet of My Writing!